A write up in your local paper! Two new links to your site from targeted communities! All of the new buzz (and traffic)! Marketing your business takes marketing your business, proactively and to the right audience. For many businesses, investing in a public relations campaign can prove an invaluable tactic when trying to drive awareness and revenue for businesses large and small. Getting your company mentioned in a major publication (or a smaller more targeted one, for that matter!) can be the breakthrough you need to become familiar, known and trusted to a broad audience. However, measuring the return from public relations, specifically tying it to your business goals, has been a challenge for marketers. Sure, you’ll no doubt see long-term impact from placing your business’ name throughout online and offline publications, but how do you measure success today? How do you know if increased placements have meant increased business, or if it’s all just a lot of talk? Thankfully, we can use Google Analytics to help shed some light on the value of public relations. The company counts on you to put out reports that track how well its marketing campaigns are doing so that everyone who cares about the marketing understands what’s working and what isn’t. You’re up to the challenge, and it really is a challenge considering everyone wants to see the analytics data their way. Sound familiar? We know it does! Different groups need to see different data in their reports. How can you manage this customization without endless hours of extra work? The solution is Megalytic Filters. Lets get started with some examples. Your clients come from a world of traditional marketing—billboards, direct mail, television ads, etc. They’re used to measuring marketing ROI based on how many individuals may have seen their message, or the potential earnings one ad spot can bring. They get traditional, but they’re new to digital marketing. Anxious to get going thanks to the onslaught of marketing articles stating they should, they still find themselves struggling to get over the educational hurdles regarding digital metrics and reporting. That’s where you–the digital marketing expert–come in. As the person responsible for campaign reporting, your job is to communicate digital metrics in a format these traditional marketers will understand. To do this, you’ll want to select the right metrics, and then use annotated reports and follow-up conversations to explain what these metrics mean and how they correlate to your client’s bottom line. Trying to build a successful brand? Then you’ll want to pay close attention to your analytics, or at least that’s been my experience. As the founder and president of Megalytic, I can tell you that using analytics to inform every marketing decision we make has been a big part of our success. The key is to use analytics to measure your marketing’s effectiveness in reaching your target audience, very specifically honing in on what’s working and what is not. But to do that, you can’t just look at top-level stats like total visitors. You need to dig into the details of your data, examining specific segments of your audience to determine who is engaging with your brand and the content that is engaging them. In this post, I show some ways our company uses analytics to yield the marketing insights that have helped us build our brand. Think back to the last time you logged into Google Analytics (hopefully it wasn’t too long ago…). Did you see something like this? 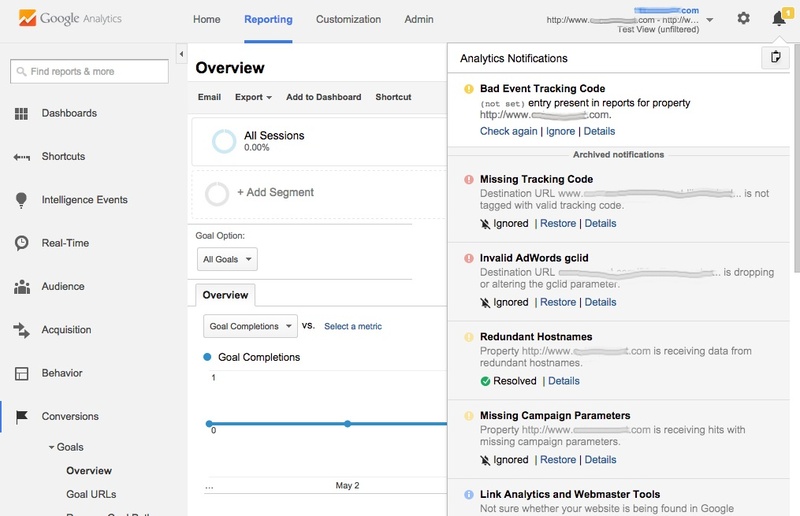 That bell symbol found in the upper right hand corner is there to alert you of any potential issues flagged in your Google Analytics account. Google makes periodic evaluations of your Analytics implementation, and then provides notifications as a gentle reminder of how to keep your Analytics account in good shape to ensure high quality data. Officially, Google Analytics refers to these as diagnostics messages. These notifications can be helpful in alerting you to issues you may not have caught otherwise. Some issues will be simple to resolve, while others may require more thought-out solutions or help from a developer. As you never want to put off issues that may interfere with collecting accurate data, make sure to review the messages coming through as soon as you see them. Diagnostic messages are color-coded as blue, yellow or red, indicating the severity level. Let’s address a few of the analytics notifications that you might receive. We are continuing to upgrade Megalytic to make the best analytics report writing and publishing platform even better. This month's improvements include Page Breaks, Dropbox (and Google Drive) integration, plus other new features to improve report formatting and image embedding. Page Breaks – Include a page break at any point in a report - details here. Dropbox and Google Drive hosting of CSV Files – Use a hosting service for CSV files so your changes are automatically synchronized with Megalytic reports - details here. Uploading Images Directly into Reports – You can now upload images from your computer to the Megalytic image library for use in your reports – details here. Improved Cover Pages – Our two styles of cover pages have been merged into a single format to simplify the creation and management of cover pages - details here. You own a business, or maybe you work for one. Whatever the situation, the business doesn’t exactly sit around and wait for customers to appear on their own – it goes out and attracts them – often through events. Sometimes that means holding an open house to get people inside your doors, or speaking at a business event to share information and earn authority. These in-person events can be extremely valuable in not only getting customers into your business, but in establishing long-term awareness. Thankfully, even when the event is offline, much of the promotion will still take place online. With online promotion comes greater ability to target messaging to the right people and to measure the performance of each source that drove people to the event. So, you’re planning an event for your business and you want to promote it online. Where do you start, and how do you track it? It’s happened. Reporting has (finally) become a priority for your agency, and your boss has decided to standardize the process with a client reporting tool. You’ve been tasked with researching and selecting the right tool, the one you feel stands out as the best choice for the agency and will provide the most value to clients (and internal dollars). Of course, you feel flattered to have been chosen for this assignment. But you’re also a little worried. How should you proceed? What should you be looking for in a client reporting tool and how will you decide which one suits your company best? Where does your search begin? In this post, we help you identify the criteria you should use to inform your decision.